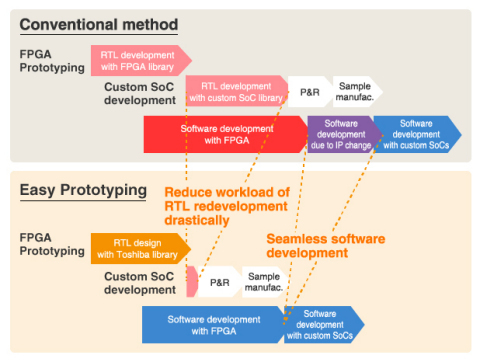 Toshiba Corporation's (TOKYO:6502) Storage & Electronic Devices Solutions Company announced today the immediate availability of “Easy Prototyping”, a solution that allows reuse of the design assets required to develop large scale custom SoC*1 with FPGA prototyping*2. Adoption of the solution dramatically shortens the development time from FPGA prototyping to custom SoC development. Easy Prototyping is available on Toshiba’s ASIC and FFSA™ *3 platforms. In conventional FPGA prototyping, SoC designers cannot reuse FPGA hardware and software design assets for custom SoC development because FPGA libraries*4 and IPs*5 are FPGA specific. Easy Prototyping facilitates the reuse of these assets for the custom SoC design by adapting the FPGA prototyping libraries leveraging Toshiba’s libraries and IP subsystems*6. This enables designers to identify the interface and easily switch between FPGA prototyping and SoC implementation with the Toshiba provided wrapper logic*7. Toshiba supports third party IPs that have good track record in FPGA and provides these IPs as subsystems which are verified for connectivity with Toshiba’s custom SoC solutions. 10 Gigabit Ethernet (MorethanIP), PCI Express®*8 3.0/2.1/1.1 (Northwest Logic), DDR3 SDRAM*9 controller (Northwest Logic) are available immediately for Easy Prototyping and the line-up is being expanded to cover additional solutions. Going forward, Toshiba will continue to provide solutions that help customers to optimize system design and achieve timely product development. Please check below web site for the details. *1: System on Chip for specific application which is not programmable after manufacturing. Its performance is superior to FPGA in general. *2: A verification method for hardware design as well as early software and firmware co-design using FPGA, a device that is programmable after manufacture. *3: An innovative technology enables Toshiba to develop integrated circuits with much lower development costs and much shorter development turn-around times by reducing the number of metal layers that must be customized. *4: Database to develop SoC. *5: Intellectual Property that is a reusable function block for SoC development. *6: The IP solution consists of IPs required to develop SoC. It is designed to be easy to implement into high-speed interface subsystems. *7: A circuit block to absorb differences such as interfaces and libraries between FPGA and ASIC/FFSATM. *8: Industry standard, I/O serial interface broadly used in computing system. *9: A DRAM industry standard used as main memory for PC and Server. *PCI Express is a registered trademark of PCI-SIG.